A pair of metal Milton Keynes Cow Cufflinks in a clear presentation box. For the person in your life that wears a shirt and cufflinks, this is the perfect gift. 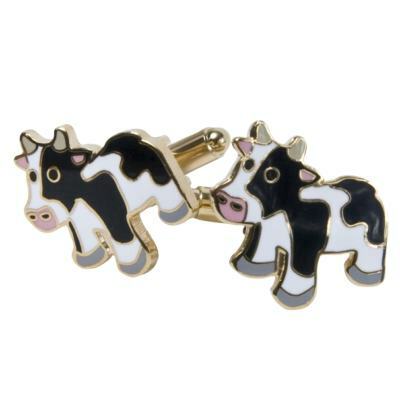 A pair of Milton Keynes Cow Cufflinks will look good on any shirt and bring a smile to those who see them. These Special Edition Cufflinks come packaged in a clear plastic box. "I just put cow cufflinks into a google search and your website appeared. They look like some of the best 'fun' cow cufflinks I have seen as I have been trying to find some for my boyfriend for some time now, you have just made my christmas shopping much easier! Thank you." "Thank you so much for the speedy delivery and the cufflinks are great! My brother works in an organisation that works with farm animals so I thought it would the perfect christmas present for him! I found you through google- by searching 'cow cufflinks' and yours were the best and cutest :) Thank you so much for the quick delivery and great service!"